Gambling beige and red silk saree created with pita, lace and patch border work.Included with matching unstitched blouse. (Slight color variation is possible.) Its a pretty faux chiffon saree for wear on Festival and Wedding. 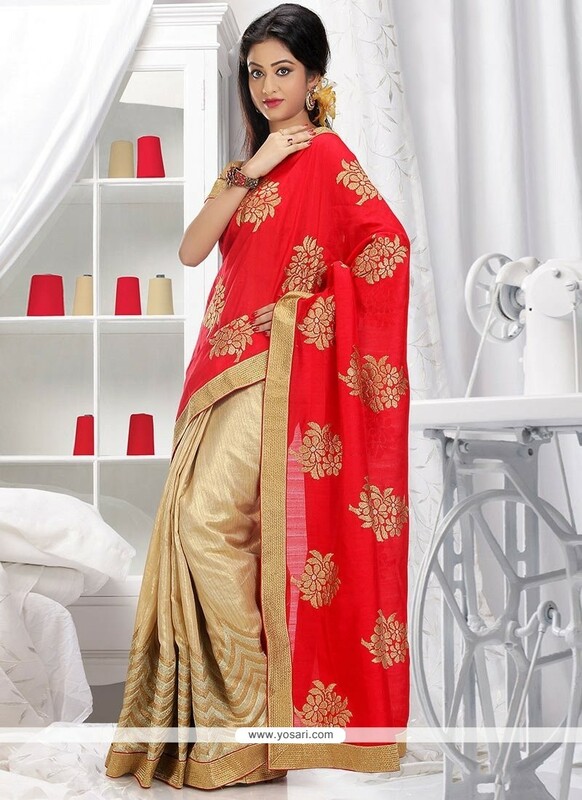 silk Fabric and beige and red color embroidery and Print used to make this stylish Saree. 1. First wash of the garment should always be Dry-Cleaned. 2. Product shades may vary slightly from the colors displayed on your screen. 3. Blouse will arrive unstitched. 4. There might be slight color variation due to lightings & flash while photo shoot. 5. Jewelry, Sandals and other Accessories wear by models in photographs are for display purposes only. • Only one blouse piece is available with one saree. Hence, we cannot arrange for another blouse for the same saree. However, we could arrange for a cotton blouse fabric at extra charges. • We provide unstitched blouse with every saree. For a stitched blouse, please furnish your measurements. You will be charged extra for the stitching. • Petticoats (Underskirts) are not available with sarees. Nevertheless, if you think you need one, we could deliver it to you. • Shimmer petticoats are available at extra cost. • All sarees measure 6.10 meter inclusive of blouse fabric. Vertically, their widths range between 40 and 42 inches. Hence, a person, who is as tall as 6ft., can wear the saree comfortably. • Unstitched blouse with embroidery on one side is available with all heavily embroidered sarees. According to your preference, the embroidery could be available either at the front or at the back. For side opening, the embroidered portion could be arranged as per your choice. • The length of the blouse fabric will be 85 cm. Hence, stitched blouse will be 15 inches long with sleeves measuring 5-6 inches. If you prefer to wear a longer blouse with longer sleeves, please get in touch with our customer care department for discussing the same. • We could add bra pads to your blouse. Please select the relevant option in the measurement form. 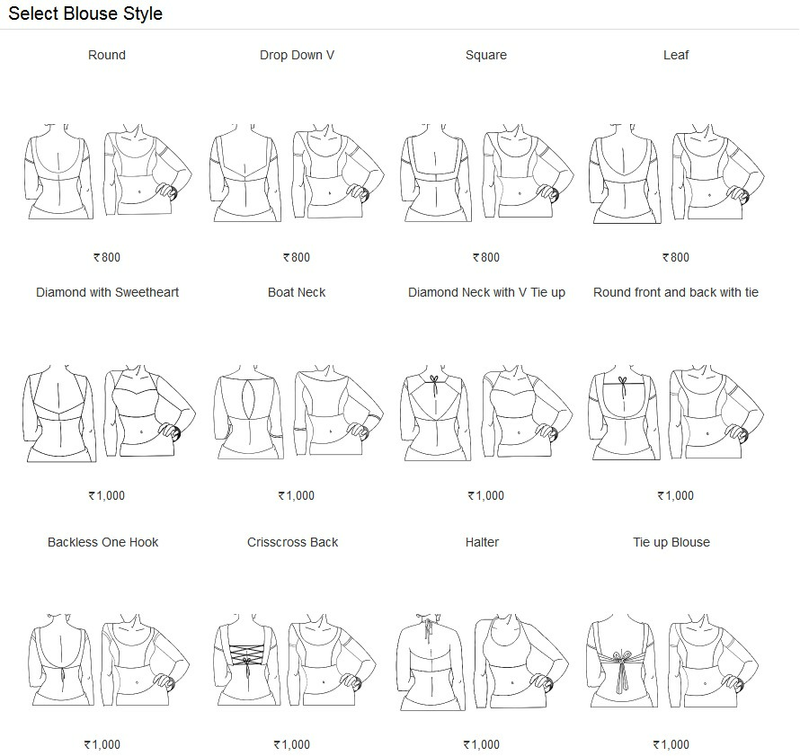 • You can select necklines from the Neck Design Section. • We generally use cotton lining for stitching the blouses. For net sarees with shimmer fabric, we use the same fabric as lining. • Edging provides the sarees with smooth ends. Falls are cotton linings stitched on the inside of the saree for protecting its lower end. • Ready to wear sarees make saree-draping fuss free and less time consuming. Our tailor will stitch the saree onto the petticoat based on the measurements that you provide in the measurement form. However, just like in regular saree, you will be required to wear the blouse separately. These ready to wear sarees have become a rage because the length of the pallus need not be adjusted and they can be worn without pleating and tucking. • Measurement form is there so that you can submit your exact body measurement with that form.